Whether it’s a new study on acupuncture, our monthly newsletter or the events we take part in across Vermont, there’s always something exciting going on in our world. These are just a few of the latest things going on with the acupuncture community. Acupuncture has been used for thousands of years, but it’s been in the last 30-40 years that the western world has really taken notice of this natural medicine and begun to study it in ernest. We’ve compiled some of the best quality studies for conditions we regularly treat here for your reference. 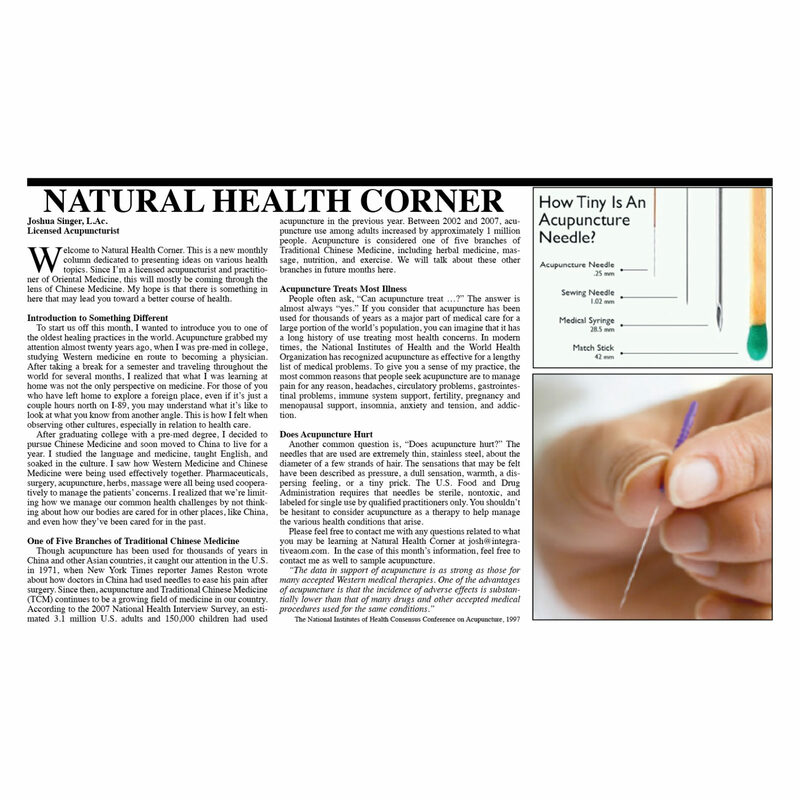 We regularly contribute a monthly natural health column to The World of central Vermont and have been featured in magazines like Try Acupuncture. We’ve compiled past articles here along with interviews and news stories about Integrative Acupuncture. We know true healing happens with the help of the whole community. We engage in public lectures, teach classes and host annual events to gather together, celebrate and learn. We love to stay in touch with our patients. We send regular newsletters with health tips, the latest in natural medicine research, and we include relevant national and Vermont politics regarding acupuncture. Find our library of past newsletters and sign up to receive the next electronic health greeting.